Registration is CLOSED, as we have met our space capacity. We will be accepting walk-ons, if there are no-shows that leave empty seats. If you would like to try to walk-on, you will be placed on a waiting list at the event and will be accepted if there is room once everyone is seated. 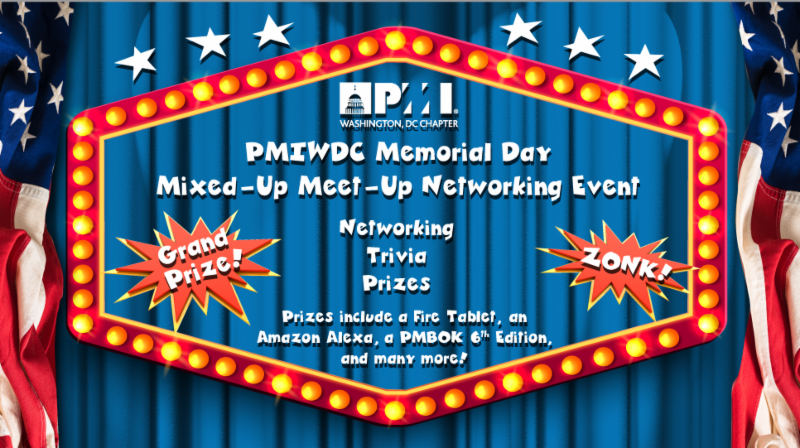 Various prizes will be given out during networking games, including a Fire HD Tablet, a 2nd Generation Amazon Echo, a 6th Edition PMBOK, and more! Please join us for a special Memorial Day Celebration in remembering and honoring military personnel who died in the service of our country with a Color Guard tribute and a minute of silence in remembrance. All attendees will receive a 4x6 inch US American Flag that can be placed in memory at the cemetery or location of your choice. Afterwards, participate and win prizes in our Networking Patriotic Trivia Challenge that will test your memory, knowledge, and experiences with Trivia and Games, hosted by Master of Ceremonies, Lisa Hammer, PMP and David Newman, PMP. Both Lisa and David are Principals of Leadership Techniques, LLC, which offers customizable leadership and project management seminars targeted to specific audiences. Both are dynamic speakers and have presented at many PMI Conferences, Symposiums, Seminars World, and at local PMI Chapter events. They have MC'd other PMI Networking events and have gotten great reviews! After the Networking event, join us for our first sit-down dinner of the year, featuring speaker Carl Pritchard, PMP, PMI-RMP, on How to Be a Great Consultant (Even if You Still Love Your Job!). Carl is a thought leader in project management and risk management. Carl is a very dynamic and informative speaker; and he will keep you engaged and interested throughout his presentation! Carl is also the U.S. Correspondent for the U.K. project management magazine, Project Manager Today. He has authored seven texts in project management, and was a lead chapter author of the Guide to the Project Management Body of Knowledge (4th Ed.). Every project manager is a consultant. The key is to be truly GREAT at your craft. In this hour, veteran consultant Carl Pritchard talks through the challenges of building a consulting practice (even in your current job) and ensuring that those around you see you as the "sage counsel" that you are. Carl takes you through the step-by-step of establishing yourself as a thought leader, and reinforces the importance of personal promotion on the job. He outlines some of the best ways to jump start your consulting role and to build a client base inside and outside your organization. Please note this will be a sit-down dinner. Seating is limited, so register now. Carl Pritchard is a lecturer, author, and recognized fixture in the project management community. He has spoken to audiences around the globe, with an emphasis on communications, leadership and risk management. He is the U.S. Correspondent for the British project management magazine, Project Manager Today, and serves on the board of directors of ProjectConnections.com He has written seven project management textbooks, created two Windows apps, and developed a PMP Certification Exam Prep practice website. He has been a PMP for 23 years, and was the second PMI-RMP certified on the planet.